Use the Dashboard to create a personalized heads-up display of all measurable stats in your ONTRAPORT account. This can be how many products you’ve sold within the span of a month, how many contacts have clicked a link in your latest email over the last week or a great number of other options. By consolidating all metrics of your ONTRAPORT account into one easy-to-use display panel, the Dashboard gives you a top-down view of what’s happening LIVE in your business at any given time. You can add new custom metrics and change the reporting period for all your metrics at once or for each metric individually. Affix a new metric to your Dashboard by creating it and setting the reporting period. The drag and drop interface makes Dashboard customization flexible. Simply arrange and configure your metrics in a way that makes sense to you. That way each time you access the ONTRAPORT Dashboard you’ll know just what to expect. Dashboard metrics calculate continuously for 3 days after it is visited. After the third day, it will change to a 24-hour calculation period. If you visit the Dashboard after longer than a 3 day period, the statistics will show as "Last updated: 1 day ago" and recalculate all metrics within about an hour. Click on Dashboard in your main Navigation menu. The name of your metric acts as its identifier on the metric grid. Name it based on what it measures - be specific. Add a condition to further refine the criteria of your metric even more. You can add additional conditions joined by AND (both conditions must be true) or by OR (either condition may be true) by clicking the + Add Condition button. Select a default timeframe. Use Custom Date Range to set your own date range (like last quarter). Counts each contact who performed an action, even if that action is recurring. How many Contacts filled out my form [Lead Magnet]? How many Contacts had [Birthday] updated? How many Contacts opened [Product Launch] email? Counts each time a particular action occurred. How many times was [Membership Product] purchased? 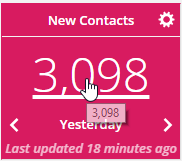 How many times did Contacts visit [http://mydomain.com/purchase.html]? How many times did Contacts click [http://mydomain.com/tracked_link]? Number of times an action was performed on or by a contact over the number of contacts who performed the action or had the action performed on them. Calculates the conversion rate between two events, only counting the number of contacts who did both events. You can specify the conversion reporting parameters: only reported once or each time the conversion event occurs. At what rate did Contacts Purchase [Membership Product] after filling out [Opt-In Form]? At what rate did Contacts fill out [Opt-In Form] after visiting [http://mydomain.com/offer.html]? At what rate did Contacts have [Appointment? Task] completed with [Made Appointment Task Outcome] after opening [Appointment reminder email]? Measures the time between two events divided by by the number of contacts who do both events. You can specify the reporting parameters of the event. What is the average time between Contact fills out [Opt-In Form] and Contact Purchases [Membership Product]? What is the average time between Contact is added to Database and Contact purchases [Any Product]? What is the average time between Contact is added to [Promo drip campaign Sequence] and when Contact is added to [Tag: Customer]? Total value of a numeric property across all contacts you specify. What is the total sales of [Membership Product]? What is the total sales of [Any Product]? What is the total amount of transactions with [Status: Refund]? Total value of a numeric Field across all Contacts in group over the number of Contacts in the group. Of Contacts in the Group "Customers", what is the average total $ sales of [Membership Product]? Of Contacts in the Group "Customers in CA", what is the average total $ sales of [Any Product]? Of Contacts in the Group "All Contacts", what is the average total $ sales of [Any Product]? Just like Rule Conditions, metrics can be further refined by specifying additional criteria that must be met, in order for the data to be included in the metric. Each of the above metrics can be displayed over a certain timeframe for pinpoint reporting. Timeframes are set to the timezone of the ONTRAPORT account, not the viewer of the metrics. In the following illustration, consider that today is Thursday, May 8, 2014. 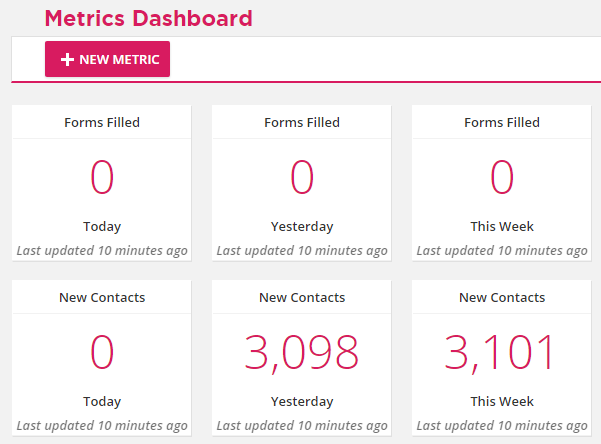 You can display the contacts that make up the metric results by clicking the number. ONTRAPORT presents the contacts in the familiar Contact Group format. 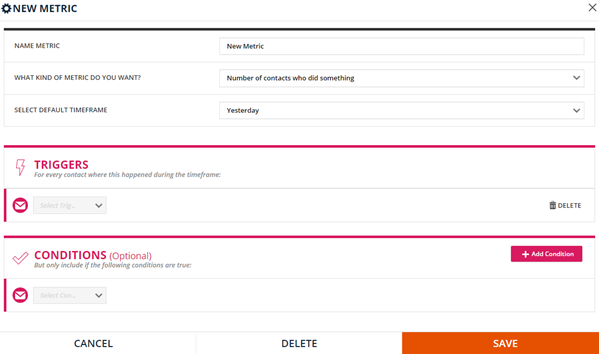 You can perform all actions on this Contact Group in the same manner you would any Group you created in the Contacts Collection. When you create a metric, you select the default timeframe associated with that metric. You can easily change the timeframe that's displayed by clicking on the arrows on either side of the timeframe on the metric as it's displayed on the Dashboard. This works for all the built in default time frames. To set a Custom Date Range you must edit the metric. All metrics will revert to the saved timeframes after you navigate away from the Dashboard.